By any measure, 2018 has been a difficult year for firefighters and emergency medical service (EMS) personnel. Firefighters in California battled the worst fire season on record, and EMS personnel were on hand during and in the aftermath of Hurricane Florence in the Carolinas, not to mention several high-profile mass shootings. This month we are focusing on the needs of these brave first responders. Firefighters and EMS workers are often the first on the scene to not only witness an accident, injury or shocking event, but also deal with the emotional repercussions – both within themselves and their community. They are on the frontlines of emergency calls and, because one in five Americans has a mental illness, are likely to encounter someone in crisis. Over time, that takes a toll. First responders are more likely than members of the general public to develop behavioral health problems, including depression and post-traumatic stress disorder, and firefighters are more likely to die by suicide than in the line of duty. 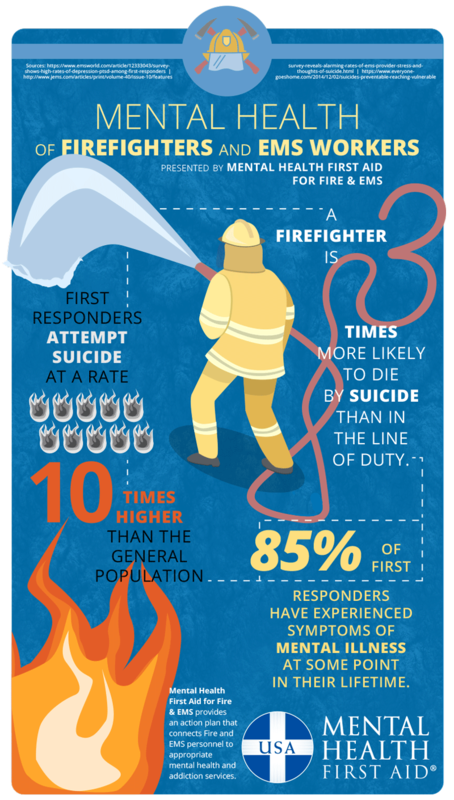 That’s why the National Council for Behavioral Health introduced the Mental Health First Aid for Fire/EMS module to provide a fundamental understanding of the common mental health challenges experienced by first responders and the skills to identify and respond to someone who may be in crisis. The program also teaches post-crisis strategies for first responders to better assess and access support for themselves, their colleagues and community members. This month, you can help #BetheDifference for our first responders. Here are some things you can do. Get trained. If you’re already trained in Mental Health First Aid – awesome! If not, look for a course in your area. If you are a first responder or know someone who is, consider taking the Fire/EMS course so you can equip yourself with the tools necessary to recognize and respond to a person experiencing a mental health or substance use challenge in the face of a natural or man-made disaster. Spread the word. Share this video and infographic to share on social media over the course of the month. Check them out and share them to inform your networks, too! Read up.We’ll be sharing stories about mental health among first responders on the blog during October. Mental Health First Aiders are making a difference in communities across the country every day. Thank you for continuing to #BetheDifference in yours.